So you slept through science class–part 11: What is a watershed? I often ask my students, “what is a watershed?” They immediately focus on the “water” part of the word. Actually, a “watershed” is about the land; it’s an area of land that drains to a specific waterbody. My local watershed is the Accotink creek watershed. If we zoom out, I live in the Chesapeake Bay watershed. What’s the name of your watershed? So why is it so important to be familiar with your watershed? Because, everything that happens on the land, eventually impacts the water. Let’s take a look at my watershed, the Chesapeake Bay watershed. This watershed has the largest land to water ratio in the world – 16:1! Areas from 6 states (about 64,000 square miles) drain into the Chesapeake Bay, and the activities of the 17 million people who live in the watershed directly affect the waters of the Chesapeake Bay. Every time anyone in the watershed fertilizes his garden, washes her car, drives her car, or salts the sidewalk for ice, it affects the quality of water in the Chesapeake Bay. The same is true for every watershed. Learn which watershed you live in using this simple website where you can search using your zipcode. After you know your watershed, the website can also help you find groups working on water quality issues in your area! Ever since I started this blog about 4 years ago, I’ve been encouraging folks to eat lower on the food chain – it’s good for you and it’s good for the planet. Today, there’s more support for this idea. The Washington Post reported that the Dietary Guidelines Advisory Committee 2015 report suggested that eating a more plant-based diet is better for your health AND more environmentally sustainable. Here’s the report for your meat-free Friday reading. Climate change–time to speak up…..again! Mr. Steeg states, “atmospheric carbon dioxide concentrations have exceeded current levels multiple times in the life of Earth, and the planet has recovered.” Right you are, Mr. Steeg! But here’s what you left out – each of these carbon levels was followed by a mass extinction of species on the planet, and although the planet did recover, it always took several million years. Mr. Steeg states, “Correlating climate change only with carbon dioxide concentrations ignores variations in sun intensity and Earth’s orbital dynamics.” The correlation actually doesn’t ignore sun intensity, etc. Scientists have checked into the sunspot hypothesis and others, and the evidence seems to overwhelmingly point back at greenhouse gases coming from man-made sources. Mr. Steeg states, “Some scientists argue that changes in Earth’s climate occur every 1,500 years and conclude that the cycles are unstoppable by human intervention.” Really? How many scientists make this statement? The current changes are not part of a cycle. They’ve occurred over approximately 100-150 years and they’re happening faster than species can adapt. I know climate change is scary, but burying our heads in the sand is not the way to address the issue. As generations before have done when confronted with daunting challenges, we must look the challenge of climate change in the eye and find a solution. It’s definitely snowy in my neck of the woods, which makes me wonder, “what are the environmental impacts of all the salt that’s spread on the roads?” It turns out, the salt can affect drinking water, but it has an even more significant impact on freshwater ecosystems. Here’s a great article from Smithsonian.com which explains the impacts and some of the attempts at reducing harm while keeping us safe on the road. I found this recipe for Penne with Arugula Pesto in Martha Stewart Living magazine. It has an unexpected zip, if you’re used to basil pesto, but my family really liked it! Super simple, too – perfect for a quick meat-free Friday! Combine arugula, almonds, garlic, lemon juice, and cheese in the bowl of a food processor (I used a blender). Season with salt and puree. Martha says to slowly drizzle in the oil while doing the puree, but I just tossed in the oil with all the other ingredients and all went OK! Boil pasta to al dente and drain. Add pesto to pasta and mix to coat the pasta. Add a few extra leaves of arugula and some almonds for crunch. Want to keep up on the latest environmental news? Be sure to “Like” greenmomster on Facebook! Have you ever lamented the numerous plastic baggies that end up in the trash at your house? Just one brown bag lunch can produce 2 or 3 dirty baggies that end up in the trash. What’s a greenmomster to do? You can’t really switch everything to washable glass or plastic containers; they could break and they take up too much space in the lunch box. Why not try washing out those plastic baggies and reusing them? I’ve been using this cool baggie drying rack for quite some time and it really comes in handy. I just wash the baggies out like I would dishes, and they can be used many times before they wear out. 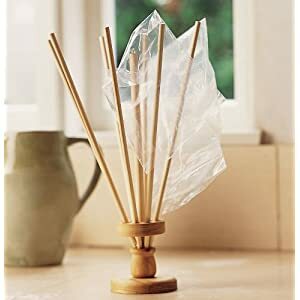 Check out amazon.com to find several manufacturers of the baggie drying racks. My husband says the fact that I use this drying rack proves that I’m either crazy,or cheap, or both (he says this in the most loving way…), but I say that the simple fact that these racks exist proves that there are a lot of greenmomsters out there! 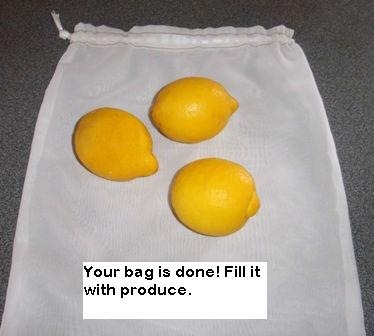 Interested in a substitution for those produce bags mentioned by Mother Nature News? Check out Marna’s easy solution!